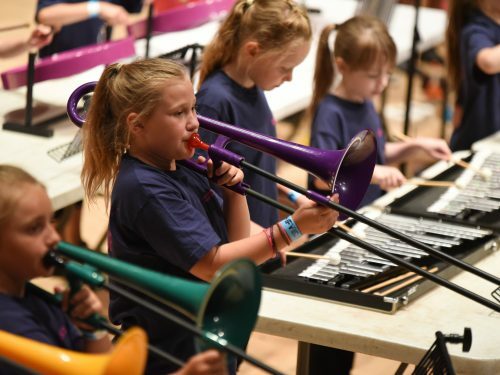 The government’s National Plan for Music Education states that every child should have the opportunity to learn a musical instrument through whole class ensemble teaching (WCET). It is the responsibility of each school to ensure that this is possible for their pupils. WCET projects are led by high-quality music teachers who will develop musical skills that can be applied in National Curriculum music lessons. Additional benefits of this scheme are the enjoyment it has brought to the children and more specifically in its ability to positively affect the self-worth, the organisation skills, the confidence and the musical development of the children involved. Many pupils choose to continue learning to play an instrument after completing their WCET programme. Our Whole Class Ensemble Teaching programme has been revamped for 2019/20 and as a result we are extremely excited to be able to offer one term of WCET to Year 4s in every primary & junior school across the County completely free of charge when you register for our Hub Subscription Packages before 28 June 2019! If you have mixed classes (e.g. Year 3s & 4s) this will be catered for. When you opt in for a WCET programme, we will be able to confirm your timeslot. Please read our Terms & Conditions of Hub Subscription Packages. Please be aware that WCET will no longer be available to purchase as a standalone product for any year groups other than Year 4, however there are many other music making opportunities available as a whole class from the Music Service. Please feel free to contact us and one of our Area Managers will be in touch to discuss possibilities for your school.